A sweeping return of victory for FKLI bulls today. Rising a whopping 30.5pts for Mar'13 contract, & a brow-rising 34pts on the Apr'13 contract, both turned from a steep discount to at premium to the underlying KLCI index. Today's mighty white/piercing sword (my very own nicknames for the candle...:p), has more than nullify the previous slight possibilities of a resume of the downtrend from 1,705 peak. We are officially back within the same old correction mode since early Feb low of 1,585.5. The best fit to the wide-range sideway price movement, starting from the 1,585.5 low, would be an ascending flat (some may consider it a bear flag...which is effectively the same technically...). Shall this explanation holds true, we are looking at the last/5th minor wave within a typical flat (5-waves, abcde). There are still room for the bullish momentum as suggested by W%R, which has yet to reach its overbought region. The two uptrend lines defining the ascending flat also suggest more upside to current rebound from 1,608 low. We are again revisiting those similar resistance levels which, by now, shall come to mind with a snap of fingers....1,655-59.5 | 1,664-68.5 (Mar12 high) | Jan21 high of 1,674 (which was missed by a few ticks before plunging down from 1,668.5 high to 1,608 low, throughout last week). I believe we shall see bulls take a breather after working at full strength this whole afternoon. We might well see slight consolidation following the superb run today. Support comes in at 1,651-53 | 1,646 | 1,638-40. 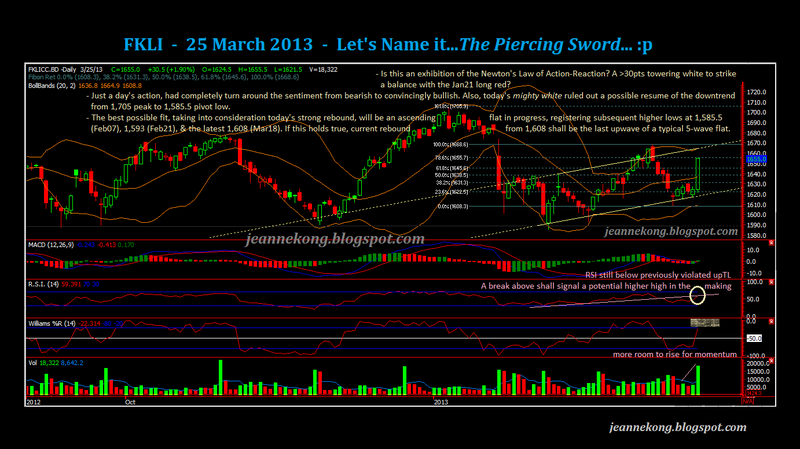 CPO price failed to overcome the 2,503-05 resistance today, closing in a bearish engulfing candle instead. On shorter timeframes, a double-top is clearly seen, restricted by the 2,503-05 resistance level. The bearish candle does not augur well for the rebound from 2,360 low the past two weeks. Furthermore, the 2,504 resistance marks a 61.8% retracement of the primary downtrend from 2,592 high since early Feb.
A close below its overbought level on W%R signalling a weakening momentum, after it peaked on Mar22 bullish close of 2,494. Further drop in momentum, without revisiting its OB region, shall confirmed a hidden bearish divergence on momentum. 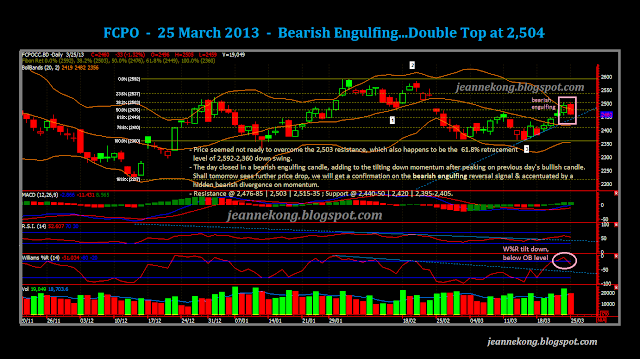 A lower open & close tomorrow shall confirm a reversal top at 2,505. Preferably, a close below the ST uptrend line carrying the rebound from 2,360 low. 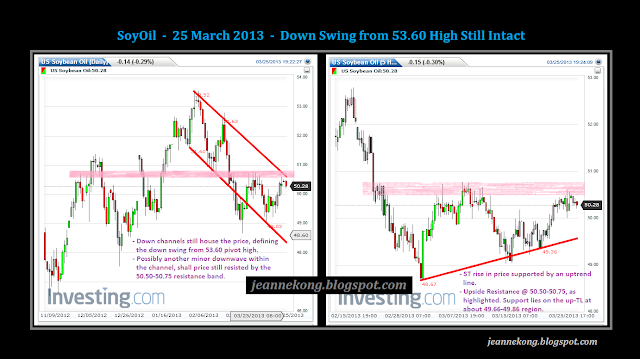 On SoyOil, price still wanders within the down-channels formed following the drop from 53.60 high. 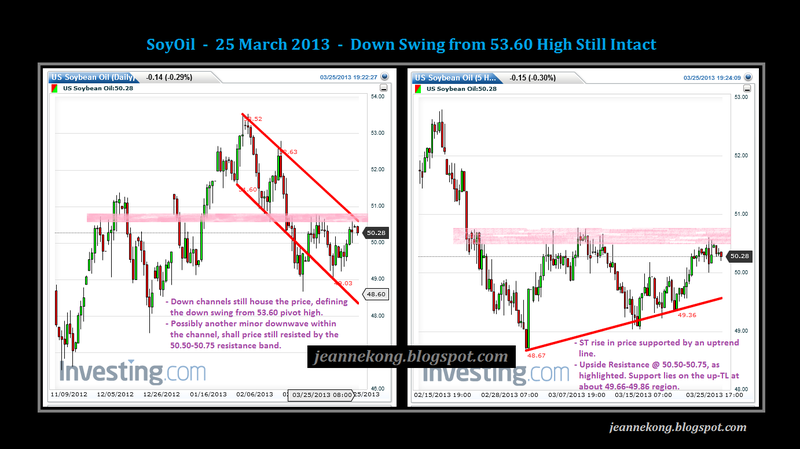 As of writing, price is consolidating below resistance level of 50.50-50.75, also near the daily channel-top. Shall the resistance level holds, we might see another downwave to find the channel bottom. If overcome, price shall chanllenge the next resistance level of about 51cents. The direction of price in near future, up or down further, shall also determines whether the current retracement is a pullback of the previous MT uptrend since Nov'12, or it has already peaked at 53.60 & reversed. Early morning trade saw it challenged the 1,664 resistance but failed to overcome. Then, went into consolidation mode after hitting a day high of 1,663.5, oscillating within 1,651-56 range. Closed 1,656. A slightly higher close than yesterday's 1,655, signals lingering bullishness. 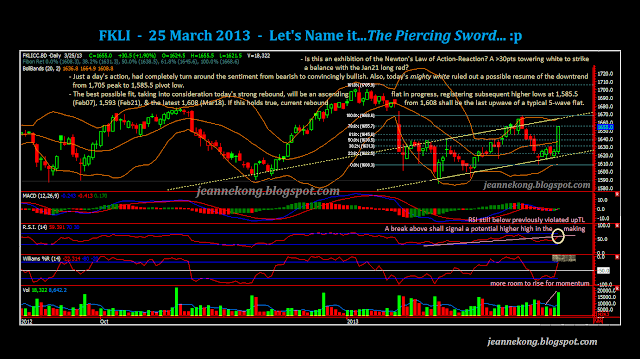 We may well see another quick test on the 1,660-65 resistance band tomorrow. I'm staying with further consolidation for tomorrow, of coz unless we see a higher high achieved tomorrow. 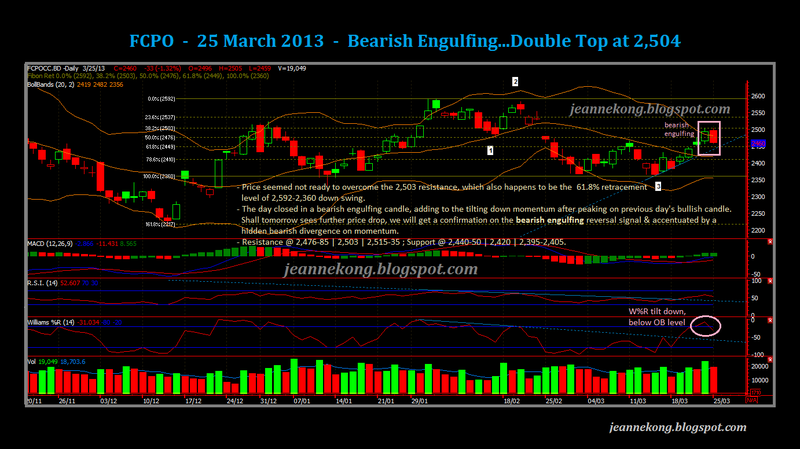 A strong confirmation of yesterday's Bearish Engulfing candle. A straight opening gap down to below the daily ST uptrend line, at about 2,450, completing the reversal signal. On the 15min/hourly, price has clearly break below of yesterday's double-top neckline at about 2,460, right at the open. Price stay low below today's open of 2,450, & sideways in tight 20pts range. Closing at 2,442 near the day's mid-range. CPO has confirmed going into a ST bearish mode. Breaking 2,360 strong base shall confirm that this is the Wave5 down-wave in progress, extending the drop from earlier 2,593 high on Jan31. By today's close, more clarity on CPO. U really impress us with your passion for the market.